I am not usually a proponent of overly sweet and chemical-packed boxed cake mixes, but when I’m in a pinch, a boxed mix can be a huge timesaver. These coconut chai cupcakes are so simple to make and elevate packaged cake mix to fine cupcake cuisine. It’s fairly easy to tell when someone uses a cake mix to prepare a dessert. It has this unnaturally sweet taste that’s an instant tip-off. 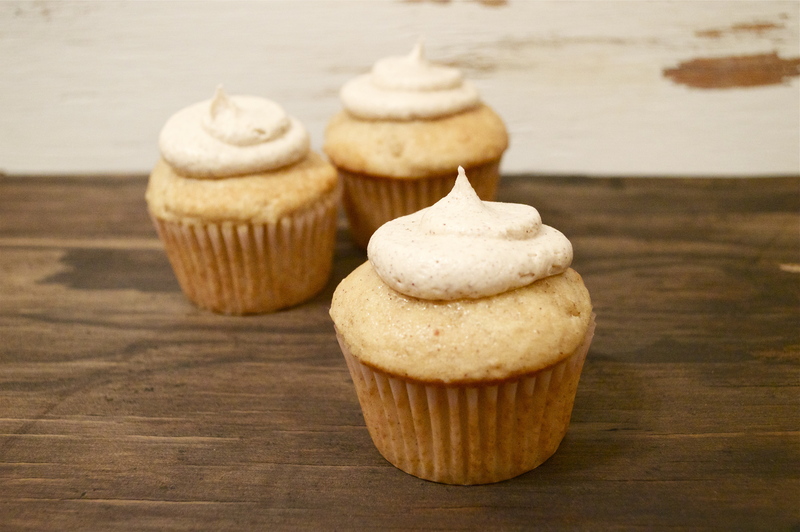 I would never use a boxed mix for a recipe that has other sweet flavors in it, but that’s why these chai cupcakes work so well. Rather than adding more sweetness to the mix, the spicy and savory chai flavor counteracts all the sugar in the cake for a balanced, yet decadent, dessert. Preheat the oven to the temperature specified on the box, and follow the rest of the instructions. Before mixing, add in roughly half of the chai spices. Once the batter is mixed, fill cupcake liners about 3/4 of the way to the brim. Bake the cupcakes for the amount of time listed on the package or until a toothpick can be inserted and removed cleanly. While the cupcakes are cooling, it’s time to whip up some buttercream frosting. Homemade frosting is the secret to turning a packaged mix into a delectable dessert. Making a basic buttercream is so easy, and it tastes immeasurably better than the super sugary stuff you can buy in a store. Start by beating the butter and coconut oil on medium/high speed until well incorporated. Next, beat in the chai spice mix. Add in the confectioner’s sugar and continue beating until smooth. Last last step is to beat in just a splash of milk, but this is optional. The milk gives the frosting a shiny, smooth quality and loosens it up a little bit. But if you like the consistency of the frosting or you’re planning on doing some fancy piping, you don’t need to add any milk, which will keep your frosting a little more stiff. Use a piping bag with an open, circular tip to place a dollop of coconut chai frosting onto the cupcakes, or cover the tops with the buttercream using a spoon. No matter how you put on the frosting, it tastes just as good. Pour yourself a cup of chai tea, take a bite, and enjoy!